Encouraging the creative arts while supporting non-profit programs at the same time, in 2006 we commissioned three Bay Area non-profit organizations that use drama, movement and spoken word in their work with youth, to create a dramatization about human rights, called The World As It Could Be – A Declaration of Human Rights. We had the privilege of working with Ellen Sebastian Chang as our Creative Director. The dramatization was presented at a convening at the Presidio in San Francisco on December 7th, which also featured David Brancaccio of the PBS program NOW, and at Balboa High School in San Francisco on December 8th, as part of that school’s curriculum on human rights. We engaged the services of recent Rex grantee Studio BAYCAT to record the Balboa High School performance and produce a DVD that can now be distributed for presentations at other schools and forums. Below is more background information on the program and listing of the creative contributors, performers, production people and generous sponsors who made this possible. We look forward to building on the profoundly meaningful experiences connected with this endeavor to continue to work toward the world as it could be. On December 10, 1948, the United Nations adopted and proclaimed the Universal Declaration of Human Rights. Its thirty articles articulate a vision of a world where all human beings have freedom of speech and belief and freedom from fear and want. In February 2006, the Rex Foundation published its newsletter Perspectives on Being Human to promote greater awareness of this vision as a connector across different efforts to right wrongs, including civil rights, economic, social and environmental justice. Desiring to convene other non-profits on this topic, the Rex Foundation began developing a program involving local youth organizations and connected with the International Convention on Human Rights (ICHR). ICHR, as part of its mission to strengthen the 1948 Universal Declaration, has been developing a human rights curriculum for high school students. Given our mutual interest in furthering awareness of and working toward human rights for all, the Rex Foundation, in collaboration with ICHR, brought together local youth art organizations to create a live production to dramatize the vision of universal human rights through original compositions for theater, dance, spoken word and song. The organizations were chosen because of their excellent work using different art forms to address the real-life issues many of the participating youth face in their lives. The performances on December 7th and 8th vibrantly demonstrated the thoughtfulness, talent and spirited commitment of the participating youth, the organization leaders and the creative director to collaboratively express the importance of being aware of and strengthening the Universal Declaration of Human Rights. Ellen Sebastian Chang is a director, writer, performer, and creative consultant. Ms. Chang was the co-founder and artistic director of Life on the Water, a nationally and internationally known presenting and producing organization at San Francisco’s Fort Mason Center from 1986 through 1995. She recently has directed critically-acclaimed productions of Philip Glass’ opera Akhnaten at the Oakand Opera Theater, Gamelan Sekar Jaya’s Kawit Legong: Prince Karna’s Dream at CalPerformances, and Stagebridge’s Being Something at the Oakland Metro Theater. Ms. Sebastian Chang is a recipient of funding from the NEA, Ford, Rockefeller and LEF Foundations, Arts Matter of New York, Zellerbach Family Fund and the California Arts Council. David Brancaccio, an award-winning broadcaster with over 27 years’ experience, joined NOW on PBS in September 2003 as co-host. Following the retirement of Bill Moyers in December 2004, David became the program’s host and managing editor. NOW engages viewers with original reporting, ground-breaking investigations and insightful interviews that probe the most important issues facing democracy, including media policy, corporate accountability, civil liberties, the environment, money in politics, and foreign affairs. Prior to joining NOW, David worked for 13 years at Marketplace, public radio’s daily business program. This event and creative project has been made possible because of the generous support of the sponsors listed below. The people within the sponsoring organizations, along with the individual contributors extended more than monetary support. They demonstrated trust in the creative concept and in the presenting organizations, along with commitment to promote the arts and grassroots efforts toward positive social change. We are grateful and honored. The International Convention on Human Rights educates people about the evolution of International Human Rights documents, including the Universal Declaration of Human Rights and European Convention of Human Rights, and provides a process for individuals, organizations and governments to draft an International Convention on Human Rights enforceable in the local courts of all countries. 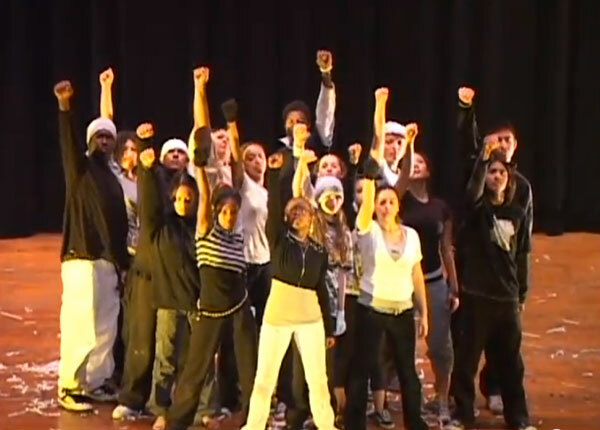 The San Francisco Mime Troupe Youth Theater Project, a Rex grantee, uses theater as a means to artistically and creatively express the opinions of young people on topics that are relevant to their lives. Youth are chosen from different communities all over the Bay Area. Youth Speaks, a San Francisco-based program with sister sites in Seattle and New York, offers teaching in the literary arts that builds critical thinking, presentation and performance skills while cultivating talents in creative writing and spoken word, encouraging youth to speak their own messages to their peers through the powerful medium of spoken word.